From bestselling authors William W. and J.A. 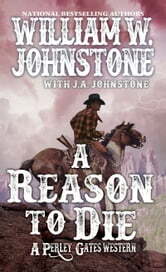 Johnstone—the explosive adventures of Perley Gates, who’s carving out his own legacy in the violent American frontier . . . Restless cowpoke Perley Gates wanted nothing more than to track down the grandfather who abandoned his family years ago. What he found was the crazy old sidewinder barely hanging on after a Sioux massacre. The old man’s dying wish was to make things right for deserting his kin—by giving his strong-willed grandson Perley clues to the whereabouts of a buried fortune in gold. Finding his grandfather’s legacy will set up his family for life. But it won’t be easy. The discovery of raw gold in the Black Hills has lured hordes of ruthless lowlifes into Deadwood and Custer City—kill-crazy prairie rats, gunfighters, outlaws, and Indians—armed with a thousand glittering reasons to put Perley six feet under. All Perley wants is what was left to him, what he’s owed. But with so many brigands on his backside, finding his grandfather’s treasure is going to land Perley Gates between the promise of heaven and the blood-soaked battlefields of hell . . . I hope there are more books with Perly as the hero.